Terafina’s solution supports multiple products on a single platform making it easy for your financial institution to stay ahead of the curve. It’s easy for customers to apply and simplifies the offering of products and services that make sense for your clients. 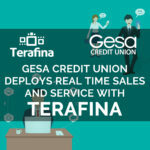 With leadership that share a wealth of digital banking and banking technology experience, Terafina continues to help banks and credit unions throughout the country accelerate growth and deepen client relationships. Our reliable and regulatory compliant platform is safe and secure offering a hassle-free experience. We have built over 30 connectors to core banking systems, lending origination systems, KYC solutions, CRM systems, data aggregation and data pre-fill providers. Clients expect a personalized journey across channels and when they prefer it, a knowledgeable sales team that can easily and readily address their questions and needs in real-time. By enabling a financial institution like ours to rapidly evolve the customer experience, Tessellate humanizes the digital experience and we are able to cultivate deep, long-lasting and profitable member relationships. Our new investment in Terafina is another example of our strategy to continuously invest in technologies and processes tailored to address members' unique evolving needs. Terafina’s Digital Sales Platform delivers a modern digital experience to our members and equips KeyPoint with the capability needed to deepen member relationships. Terafina helped us leapfrog ahead of many of our competitors and transformed First Tech to become a very relevant 21st century player.